A man died by suicide after he jumped off the Empire State Building, the third tallest building in the United States. The man's name is Cameron Dabghi, and he was a Yale University student at the young age of 21-years-old. Dabaghi was from Austin, Texas. He was expected to graduate in 2011 majoring in East Asian studies. Yale College Dean Mary Miller wrote in a message to students today, "We are all deeply distressed by this news." Police are investigating the incident. It is believed that Dabaghi took a running start and climbed and jumped off at the 86th floor. This is important to note, the building is 103 story's tall so he did not jump off the top. Dabaghi jumped during rush hour traffic at 6:15 p.m. on March 30th. He fell down in front of a Bank of America business. A man covered his body with an umbrella to cover his shattered body. The last believed suicide jumper leaped from the Empire State Building in 2006. Authorites believe there has been a total of 34 people who have jumped to their deaths from the Empire State Building since it opened in 1931. Jerry Smith's world was occupied by HAARP, Burning Man, black helicopters, and Loch Ness. Smith died at 3:00 am on the morning of Monday, March 8, 2010, of pancreatic carcinoma (pancreatic cancer), I was informed by Kenn Thomas, editor of Steamshovel Press, moments ago. Smith, born on April 8, 1950 in Pomona, California, was an author, lecturer and editor on unexplained phenomena, but sometimes remained behind the scenes in recent years, as a ghostwriter. Interests that had him ranging from Loch Ness to Burning Man, the well-known writer to a select few was a true friend to many in the field of unsolved mysteries. In recent years, Smith had operated out of the World Explorer's Club in Kempton, Illinois where he worked for Adventures Unlimited Press as the Vice President for Marketing and Public Relations. Smith's acknowledged bibliography of published works includes three books from Adventures Unlimited Press (AUP), scores of non-fiction articles and reviews, and more than a dozen ghost-written books. Smith began his career in writing and publishing in the little magazine field in 1966, writing and publishing his own amateur sci-fi fan magazine (called a fanzine or just "zine") in the Valley Science Fiction Associations' Valley Amateur Press Alliance (ValAPA) of Pomona, California. He was active in the zine scene throughout the late '60s and early '70s, appearing regularly in zines and APAs, like the Los Angeles Science Fantasy Society's APA-L, and culminating with his founding of the Unicorn Society and its Unicorn Amateur Press Alliance (UnAPA) in Klamath Falls, Oregon, in 1974. 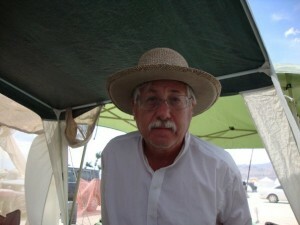 Some of Jerry Smith's happiest moments were at Burning Man in Nevada, where he had years ago lost his best friend Jim Keith (shown below), in a strange "accident" in 1999. 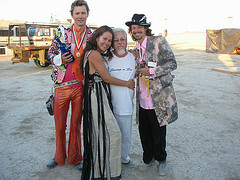 Above are photos of Smith at Burning Man in 2009 and earlier. 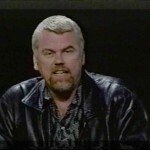 As the close friend and literary partner of the late Jim Keith (author of Mind Control, World Control, and many others), Smith was often involved with projects with Keith. Jim Keith was Jerry Smith’s best friend from high school until his untimely death in 1999. Among their many projects together, they ran the regional newspaper Skyline: Klamath Falls; and co-hosted a radio show broadcasting from the campus of the Oregon Institute of Technology. Smith helped on several of Keith’s books, particularly Black Helicopters Over America: Strikeforce for the New World Order and Secret And Suppressed: Banned Ideas & Hidden History. In 1990 Jerry Smith and Jim Keith founded the National UFO Museum (NUFOM) in Reno, Nevada. Smith worked as the Executive Director, while Keith acted as the Chairman of the Board. In addition to his administrative duties of running the day-to-day operations of NUFOM, Smith also edited and wrote for that organization's quarterly journal, Notes from the Hangar. At the same time Smith worked as an editor/graphic artist with Keith's magazine Dharma Combat: The Magazine of Spirituality, Reality and Other Conspiracies, where Smith served variously as Managing Editor and Art Director from its inception in 1988 until Keith’s death. Smith's first book from AUP was HAARP: The Ultimate Weapon of the Conspiracy, which considered conspiracy theories connected to the High Frequency Active Auroral Research Program (HAARP). The book, published in 1998, has been described as "blurring the lines between fiction and non-fiction" by detractors, and as "comprehensive and erudite" by other reviewers. While the author admited that his work is speculative, he also contended that it was not intended to explain how HAARP works, but rather to summarize the many claims made about HAARP on the Internet and to analyze their validity. Smith focused on two major points: the United Nations' Convention on the Prohibition of Military or Any Other Hostile Use of Environmental Modification Techniques and mind control. After giving a brief history of each he then speculated on whether these technologies were being developed, at HAARP or elsewhere, and if so, in furtherance of whose agenda. Smith's second book, published in 2005, was about the so-called Spear of Destiny, and focused on Nazi occultism and urban legends about a Nazi base in Antarctica. His third book for AUP, published at the end of 2006, Weather Warfare and covered the history of weather modification from the "rainmakers" of the 1890s through the development of cloud seeding in the middle of the 20th century, including today’s suspected ability to manipulate hurricanes. Smith believed that the refusal of the mainstream scientific community to believe that terrorists and/or the military are capable of, and currently engaged in intentional manipulation of the environment skews the data in the global warming debate. For the last dozen years or so, until his cancer slowed him down in 2009, Smith had maintained an exhausting schedule, appearing regularly on TV and radio, as well as speaking at seminars and conferences across the US and around the world. Smith, Jerry E. HAARP: The Ultimate Weapon of the Conspiracy. Kempton, Il. : Adventures Unlimited, 1998. ISBN 0-932813-53-4. Since HAARP's North American release in 1998 it has been translated into Portuguese, in 2005, by Editora Aleph of São Paulo, Brazil as ARMAS ELETROMAGNÉTICAS: seria o projeto Haarp a próxima ameaça mundial? and in 2001 into Polish by Amber Supermedia http://www.amber.sm.pl/ as HAARP BRON OSTATECZNA. --, and George Piccard. Secrets Of The Holy Lance: The Spear of Destiny in History & Legend. Kempton, Il. : Adventures Unlimited, 2005. --. Weather Warfare: The Military's Plan To Draft Mother Nature. Kempton, Il. : Adventures Unlimited, 2006. The Universal Seduction Vol. 3: Piercing the Veils of Deception - Volume 3, by “Angelico Tapestra--The Collective” (an anthology, the name "Angelico Tapestra" represents a group of collective writers comprised of “world recognized authors, investigative journalists, mathematicians, engineers, scientists, and scholars.” Smith was one of the authors featured in this volume with his article “The End Of The World” which was a portion of a chapter edited out of HAARP). BookSurge Publishing, 2004. The Conspiracy Reader: From the Deaths of JFK and John Lennon to Government-Sponsored Alien Cover-Ups, by Joan D'Arc (Editor), Al Hidell (Editor) (an anthology comprised of articles that had previously appeared in the magazine “Paranoia: The Conspiracy Reader.” Smith was one of the authors featured in this volume with his article "Star Trek: Sci-Fi or Psy-War?”). Citadel Press, 1999. 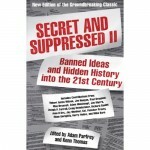 Secret and Suppressed II: Banned Ideas and Hidden History into the 21st Century, edited by Adam Parfrey and Kenn Thomas. Smith was one of the authors featured in this volume with his article "Secret Weather Wars: Mind Control, HAARP and Chinese Take-Out." Publisher: Feral House, 2008. "Exploring Black Rock City: America's Newest "Lost" City." World Explorer, Vol. 4, #7, 2007. "Invisible Warfare: Geophysical Weapons of the Secret Government." Paranoia: The Conspiracy and Paranormal Reader, Issue 45, Fall 2007. "Weather Goes To War." Atlantis Rising, #65, September/October 2007 [Originally published in somewhat different form in Steamshovel Times: Connecting The Dots on May 8, 2007, and the same week in the English online journal Conspiracy Times. "The End of the World." The Universal Seduction: Piercing the Veils of Deception. Vol. 3. Angelico Tapestra, ed. Charleston, SC: BookSurge, 2004. "Hijacking The Election?" Nevada Territorial News, Vol. 1, No. 26, December 7, 2000. "Jimmy Carter Could Never Certify A Nevada Election." Nevada Territorial News, Vol. 1, #23. November 2000. "Space Cowboys: A Movie Review." Nevada Territorial News. Vol. 1, #14, 2000 August_24. reprinted in Nonstop Fun Is Hard On Your Heart. #2. August 2000. Co-authored with Juanita Cox: "Telecommunications Bill Raises Constitutional Issues." Sentinel of Freedom. Vol. 5, #1, Summer 1997. "Star Trek: Sci-Fi Or Psy-War?" Paranoia: The Conspiracy Reader. Issue 14, vol. 4, no. 3, 1996. pg. 30-32; reprinted in The Complete Conspiracy Reader: From the Deaths of JFK and John Lennon to Government-Sponsored Alien Coverups. Al Hidell, Joan D'Arc, eds. New York: MJF Books, 2003. "Uncle Sam Is Trying To Kill You!" The View. Reno, NV: 1990. Keith, Jim. "Sinister Forces In Our Skies: The UFO / Black Helicopter Connection." UFO Universe Magazine. 1995. --. "Black Helicopters Over America." 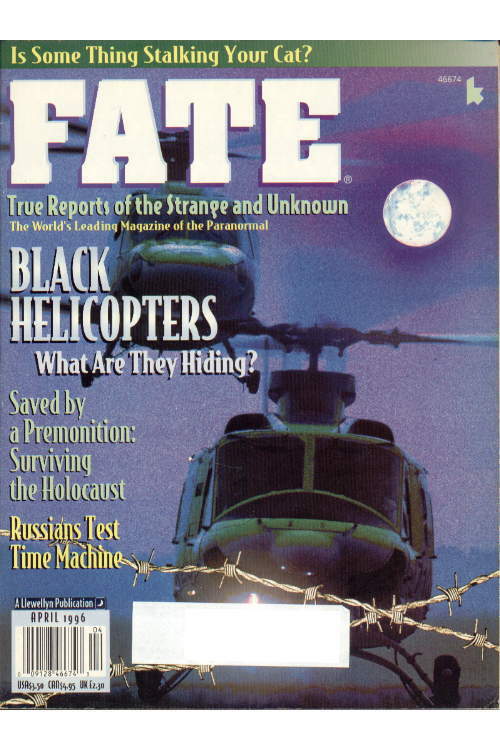 Fate Magazine. Vol. 49, #4. April 1996 pg. 28-31. Jerry E. Smith and The Loch Ness Monster! 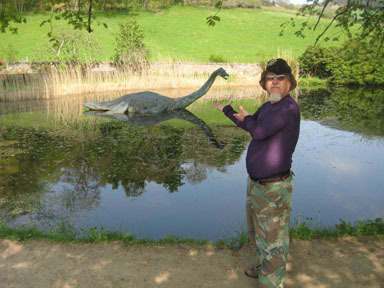 This photo of Jerry E. Smith and a replica of the monster was taken at the Loch Ness Visitor Center in the famous village of Drumnadrochit on the banks of Loch Ness, Scotland, by David Hatcher Childress on May 12, 2008. Associated Press photographer Cliff Owen captured some striking images from the scene of the news conference about J. Patrick Bedell's shooting at the Pentagon. 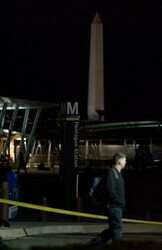 The object visible in the distance, of course, is the Washington Masonic Monument obelisk. J. Patrick Bedell, 36, who attempted to enter the Pentagon on March 4, 2010, not with a pass, but with two 9 mm guns, was a 9/11 Truther, "suicide-is-murder" conspiracy investigator, and more. He has been declared dead, as of the morning of March 5th. The news of the shooting and his suicide-by-cop death is easy to find online. I'm interested in a lot of things, including: photons, molecules, and their interaction; biomolecular analysis and manipulation; microfabrication; CMOS integrated circuit design; DNA and quantum computing; economics; history; and biography. The overt investigation by authorities is now centered on California, where he appears to have been in recent weeks. Perhaps he was with his sister, whose address (Hollister, CA) is listed for the delivery of his desired books. Or, as Amazon.com notes: "This Wish List includes a ship-to address, so you can pick out an item and have it sent to J. Patrick Bedell at checkout." Bedell noted as his hometown that of Austin, Texas, which I'm sure, is getting attention too. It has been discovered that Bedell had a early interest in the 1991 alleged suicide of Marine Col. James Sabow, which Bedell felt was a covered-up murder. #1. The Commission: The Uncensored History of the 9/11 Investigation by Philip Shenon (added July 25, 2009). #51. Barry & 'the Boys': The CIA, the Mob and America's Secret History by Daniel Hopsicker (listed on December 18, 2001). #10. Hell Ranch: The Nightmare Tale of Voodoo, Drugs & Death in Matamoros by Clifford L. Linedecker (added March 7, 2007). #12. 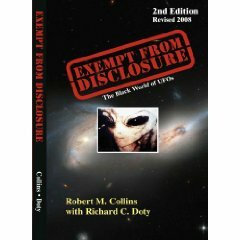 The Black World of UFOs: Exempt from Disclosure by Robert M. Collins with Richard C. Doty (added February 5, 2007). "You are relating our physics to their crafts - cant do that. That was our mistake for many years. To get into outer space, they use THEIR system. To understand their system, you must understand their physics..."
--A number of named sources some of whom worked at Groom Lake for over 40 years will tell their story of Area 51, and S4. And, Rick Doty as a contributor confirms many of the stories of Bob Lazar. --So then, what is the Crystal Rectangle CR according to those DIA TS/Code word documents? Its an H5 Alien Energy Device that can power the ISS, but yet no bigger than a 9 x 12 cardboard box less than 3 inches thick. --Why is Los Alamos LANL having so many problems with the reverse-engineering, specifically, the anti-gravity two tier propulsion system and materials. The Alien Propulsion System is described in detail. According to a Top Secret/Umbra 5 November 1961 National Intelligence Estimate NIE propulsion studies were being conducted at LANL. --From the Roswell Incident of July 1947 where were the recovered artifacts kept at Wright-Patterson AFB? --EBE-2 & those CIA Secret/Top Secret memos said to be real by a number of sources. Kit Green as a former CIA employee claimed he saw the same type of stationary used for the memos and some of the key acronyms. --JFK & Mj-12:Two separate sources support the fact that there was an EXCOM Executive Committee, who were also members of 5412 meeting at the time/date specified in the Project Jehovah MJ-12 document which mentions NSA decoding the Alien Codex and the CIAs MJEBEN program. --The 1991 Government Disclosure effort that flopped. --Did Area 51 get started in 1955 or, was it really 1951? Robert M. Collins: A former Air Force Intelligence Officer (Chief Analyst in theoretical Physics) at the Foreign Technology Division (FTD) now NASIC (after three name changes) Wright-Patterson AFB Ohio with an extensive background in Aircraft Avionics Systems, Ground Communications, and Engineering Physics (Electro-Optics, Plasma, and Nuclear Physics) totaling over 22 years. His first UFO contacts were made at FTD starting in 1985 and continue to this day with research and the publication of four book editions of Exempt from Disclosure. Rick C. Doty: In the spring of 1978 he was recruited by the Air Force Office of Special Investigations (AFOSI) to become an agent. 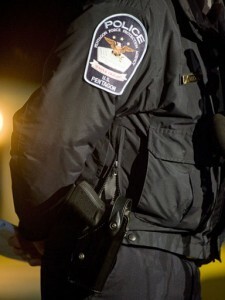 He passed all the necessary requirements and tests and was sent to the AFOSI Academy in Washington, D.C. Successfully graduating from the academy he was sent to District 17, OSI, Kirtland AFB New Mexico in May 1979. During that first year he was briefed into a special program. The program involved the collection of intelligence and counter-intelligence information for UFOs and "other foreign intelligence." Recent accomplishments (along with other "associates") include consulting work for both the X-Files and Spielberg's "Taken." In actuality, the book has been found by many serious ufologists to be a rambling treatise on such apparent mythical or hoaxed organizations like MJ12 and the mostly discredited tales of Bob Lazar. Indeed, Lazar's critics have pointed out that "Lazar's credibility crumbled" after "schools he was supposed to have attended had no record of him, while others in the scientific community had no memory of ever meeting him." This not-terribly-well-edited book fits into J. Patrick Bedell's wish list well, it seems. Wikipedia appears to have already taken down Bedell's self-authored page; however Bedell's web footprints are being gathered by some rightwing bloggers who are trying to tie Bedell's actions to a bizarre brand, in their thoughts, of "liberal" mindset (e.g. here, here, and here). All I can say, at this point, is that I was glad to not see The Copycat Effect on his "wish list." As it turns out, Bedell's actions fit perfectly into the mayhem that has visited this country in the form of "active shooters" since the Ft. Hood shootings.